The days of the village craftsman may no longer be with us, but there is still a place in our homes and communities for traditional craftsmanship. Handmade chairs, wooden hayforks and other country crafts remind us of a simpler time, when we worked side by side with family and neighbors. When artisans demonstrate time-honored skills at historical societies and living history museums, they both educate and entertain. 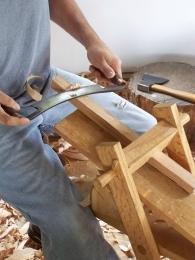 Teachers, who share their knowledge of old tools and hand craftsmanship help to preserve these traditions, reconnecting us to the past and to each other.